Barefoot Angie Bee: Barefoot Runners Society is back! Barefoot Runners Society is back! As many of you my know I am a barefoot runner... When I began my journey I didn't do it alone. One of the first things I did was google barefoot running and I came up with the Runners World Barefoot running forum. It was in its infant stages and many of those first members were starting out on their own journeys also looking for camaraderie. 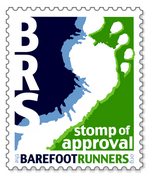 As we grew we so did the inspiration and ideas for the Barefoot Runners Society. Ideas that were tossed around with passion and enthusiasm were made into reality by some determined soles. I don't know the intricacies of growing and creating a website but I do know that it has taken countless hours and if there was money involved it was out of pockets of those working on it. It has been loved and nurtured all along the way. The President of the BRS, TJ, is always so helpful and open to work on all that is BRS and as a mother I know that takes a lot to put so much of yourself into something when at home there is so much asked of you already. TJ will always have my respect for what she has done to promote barefoot running. She was the one to convince the RW barefoot running forum people to start that forum and her vision has grown to be so much. The BRS has recently suffered from growing pains. Ah, I remember growing pains. The most memorable were when I was about 5 and calling out in the middle of the night to have my mother come and rub my lower legs. Over the last five or six years I in turn have rubbed and massaged all four of my sons legs in the wee hours of the night. We grew tall and strong though despite the discomfort and awkwardness in the beginning. So the BRS was down for a bit but now its back and better than ever! 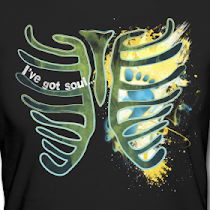 In the spring of 2010 I decided that I had better step up and do my part so I became the Iowa Chapter President and have been working to get meetups scheduled and an event planned for the International Barefoot Running Day in May. Being that its snowy and about 6 degrees here in Iowa right now its hard to plan enthusiastically but I am getting it done and have even done my first barefoot running speaking engagement to promote it. Iowans have you joined our chapter yet? If you are not from Iowa look for a chapter near you. If there isn't one then maybe you are the next chapter president?! Barefoot running is all the rage these days but it is much more than just taking off your shoes and it is a whole lot easier to do it with others to help out along the way. Below are more links to get you started! The Iowa IBRD event will be at Grays Lake here in Des Moines at 9:00 a.m. If you have questions please don't hesitate to contact me at angiebeehotz at gmail dot com. Facebook is a fantastic way to stay in touch as well. BRS facebook page. As I am a newbie, just getting into barefoot running, I would LOVE to find a group like this in Omaha! We're not far from Des Moines, but a little too far for a weeknight meeting! If you know of anything in my area, please let me know! Thanks for all your inspiration Angie! Great article. Plan on being there MAY 1, 2011. You are doing a great job with BRS. here is the link to the Nebraska chapter of BRS! The Omaha Marathon has a barefoot division too! I hope to be able to run it this year. You would always be welcome to meetups here and they would be on the weekends! Let me know what you find in NE. I am sometimes in Omaha doing events or samplings for nuun! i love and adore your passion and that you really and truly get out there to help and inspire other runners! THis is good news! I always love barefoot running as much as I love running with barefoot running shoes. Stay fit and healthy! I have always loved shoes. Such style possibilities :) My love has just changed and grown to be a love of minimal shoes. I prefer in the warm months (anything 30ish and above temps) to run barefoot but this winter has been great for testing and wearing minimal shoes!! Just FYI, there's a typo in your header graphic. It should be "it's" not "its" in the sentence "its more than just taking off my shoes..."